Clyde 7's Story . . . Original: "Clyde had a good start to life and now has worlds ahead of him to explore and conquer." 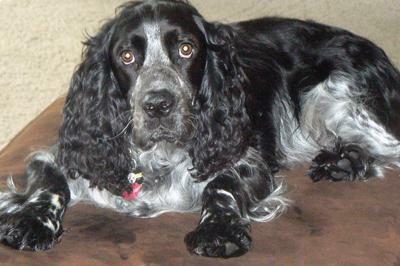 Clyde and his sister Gypsy were much loved by their original family in Pennsylvania. Unfortunately, one of the family children was diagnosed with severe animal allergies. The parents called MAESSR knowing that caring families would be found for their beloved pets. Little sweetheart, snuggle bug, laid back are just a few of the terms used to describe this handsome pup. While Clyde may be shy at first with people as well as other dogs (stay out of my face! 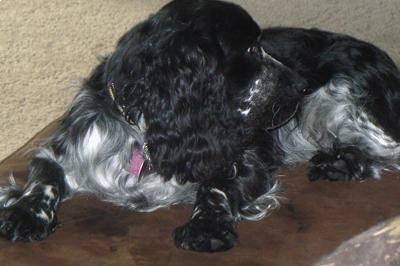 ), once he meets folks on his own terms, he is the normal Velcro Springer. He likes to be the one to approach and test things out, whether it is a visiting dog or a new situation. Cats are OK but do need to be scolded with a bark when they’re up on a table or counter! Clyde walks well on the leash and is trusted off leash in his foster family’s yard, always wanting to stay close to his people and his pack. He loves to play tug with his foster brother and, although he’s still debating about the nearby stream, will get in and try it for awhile. Tennis balls, Frisbees, and empty water bottles are his favorite playthings; he’ll leave the squeaky toys to the rest of his canine family. He knows the commands “come,” “sit,” and “down” and has shown excellent behavior on car rides. Inside, Clyde is the perfect toddler. He has not had any accidents in his foster family’s house and signals his need to go out by standing at the back door. He does not counter-surf and has not had an opportunity to explore the trash. He does, however, join his canine and human siblings on the furniture. The only inappropriate chewing he has done has been on children’s toys left in inappropriate spots! Clyde stays in a crate contentedly when his family is not at home and can be found there at night—if he is not sleeping with one of his human siblings! He loves his big stuffed puppy that came to the foster home with him. This tolerant pup was cooperative with grooming and having his ears cleaned by his foster family; he is still waiting for his first trip to the vet. Clyde had a good start to life and now has worlds ahead of him to explore and conquer. MAESSR only places puppies in homes that are committed to training and bonding with the pup in obedience classes. Puppies require a lot of care, attention, and patience, and they do chew on things! The decision to get a puppy and raise it to be a healthy, happy, and well-adjusted dog is a serious commitment. To reinforce this commitment, MAESSR requires all adopters of dogs under 1 year-old to enroll their puppy in an obedience class within 60 days of adoption. Is this the boy for you? 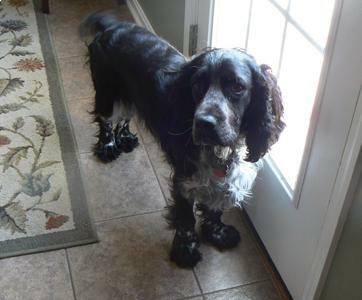 Are you ready to play ball, Frisbee, maybe go swimming and have a Springer love bug to cuddle? Clyde would enjoy a home with kids and other dogs, but, this low energy pup will be happy anywhere he has his people.